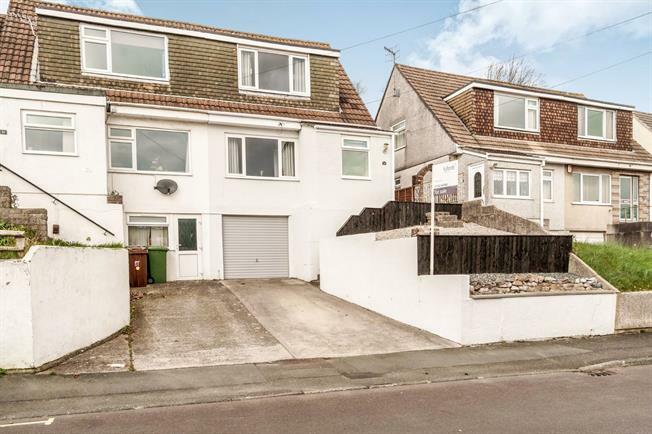 4 Bedroom Semi Detached House For Sale in Plymouth for Asking Price £250,000. This semi detached house is deceptively spacious, the property has an entrance porch, hallway, lounge, open plan kitchen diner, bathroom and four bedrooms. Outside there is a driveway to the front which leads to the garage which has power and light. The rear garden has raised flower bed, lawn and also a raised patio at the top of the garden. The property is presented to a very high standard and has double glazing and gas central heating. Stairs to first floor, door to lounge and also a door to the bathroom and a radiator. Window to front aspect, wood flooring and door to the kitchen diner. Panel bath with mains fed shower over and screen, low level W/C, pedestal wash hand basin heated towel rain and obscure double glazed window to side aspect. Window to front aspect, built in wardrobes and radiator.